I'm beginning to learn that keeping house is very much about problem-solving - Seeing a need and figuring out a solution. Gone are the days where I look for a store-bought solution, and here right now are the ones where I do my best to use what I have. So, in the spirit of thrift and creativity, there's been a little re-purposing going on around here! My first problem was that welcoming the baby to the table for family meals, albeit wonderful and adorable and fun, is also very messy. 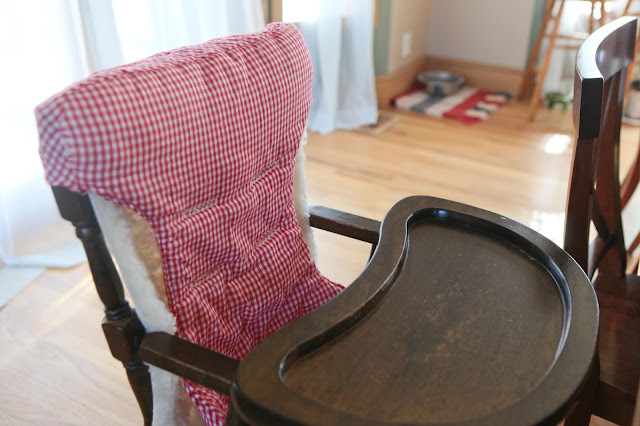 At first, I had a little wool cover (that was originally intended to fit over a changing table pad) which I put in her highchair as a cushion. But it quickly became apparent that washing sticky bits from the wool was not the easiest or best solution. So now I have an old washable cotton car seat liner placed over the wool. Baby still gets a nice cushy spot to eat, but I don't spend hours picking at wool (and by that, I mean the un-fun kind of picking at wool). Another recent need is a place to store my extra laundry powder so I could make big batches at a time and have easy access to it. 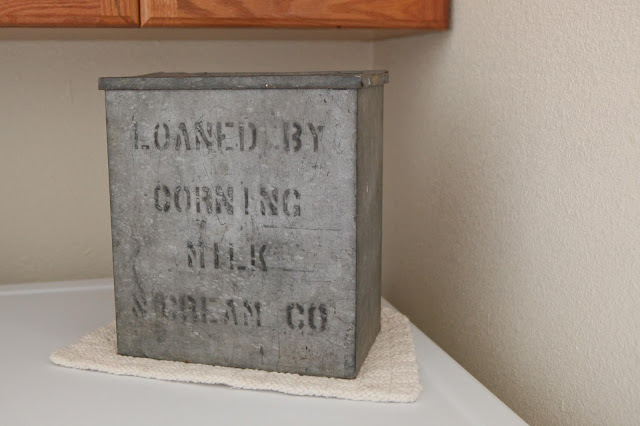 This old metal milk crate turned out to be a great solution, and it's fun to see such a charming old thing sitting on top of the washer. Next up is my on-going and ever-growing problem of how to contain kitchen scraps before they're brought out to the animals or compost. I've used bowls, but they're cumbersome without any handles. I've used bags, but they leak and are wasteful. I've used buckets, but they're quite large to sit on the counter, don't have lids, and before you know it, there are little fruit flies in your kitchen (even in winter!). I needed some reasonably-sized containers with lids and handles that could be dumped, rinsed out, and re-used. As luck would have it, my mom had been given this set of canisters as a gift awhile back. She didn't have a used for them, so she gave them to me! With a little labeling and the making of make-shift handles with a drill and some chicken wire, I think they will work out beautifully. A little re-purposing. A whole lot of satisfaction. 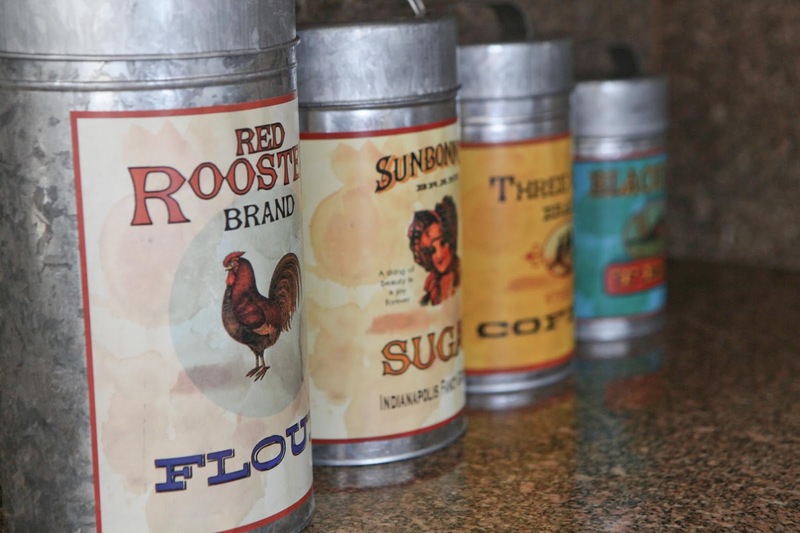 I really like those canisters, not sure I would be able to use them for food scrap buckets! LOL!! I know, they're cute, huh? :) I think they'd make great flower vases, too, but for now they get to do the dirty work! Love it!! I am becoming a fiend for repurposing. I look at everything in the house to see what I could re-use things for, and it is so fun. My new favourite is repurposing clean tin cans to corral our dizzying array of pens, markers, coloured pencils, popsicle sticks, etc. I just cut a piece of pretty fabric (like felted wool) to wrap around it, a few stitches, pop it around the can, tie a little ribbon on it and voila! Stylish holders. Ooh, how clever! I sometimes use tin cans for potting herbs. And I have one I painted long ago that I use to hold crochet hooks. You're right, it's great fun! Love all your solutions. It's great to find really pretty ways to serve practical (and sometimes dirty!) purposes! That's such a good point, Mia. Sometimes practical things aren't the most pleasant to look at, but there's often beauty in simple re-purposing. Love your ideas, especially the kitchen scraps. We do bowls right now, but I am always looking for a better solution. Might have to peek around some second hand stores for some cannisters. Great ideas there Jaime...i have that same problem with the compost and am yet to find a great solution! I know what you mean about food and the wool....been there done that...love your solution! You're house looks so charming Jaime! And you know I love the idea of re-purposing! Jane, you are too kind! It's definitely a work-in-progress. Love it! There's something really satisfying about re-purposing things. That milk crate is beautiful in a simple kinda way. I wish I were that creative around the house. Outside I'm better at finding solutions for things. You know, I surprised myself a bit ;) I'm not usually good at this, but you know what they say.."necessity is the mother of invention"! I'd say excellent repurposing! I've not been satisfied with my method of dealing with kitchen scraps before they go out to the compost either. Your canisters are lovely. Maybe I should try something similar. Very clever ~ what website did the labels come from or did you purchase them? You are so insightful to seeing the "new in the old"! Thank you for your sweet words! The canisters already had those pictures on them, but I used a handheld labeller (like one from an office supply store) for the white labels you probably saw in my most recent post. I'm glad your able to give your food scraps to the animals on your farm. It's a shame so many people waste food by throwing it out.